When I saw this coin, I thought to myself why would anyone want to have a quarter cent? But then of course, we have to remember that a 100 years ago (this is a 1901 coin), one cent was a lot of money. Most coins were one cent, of course, there were $1 coin too (the British Trade Dollar was very popular) but at the very lowest level, 1/4 cents and 1/2 cents were also in use. Lately I have been paying attention to notes issued by Disney. These notes are not currency notes in the normal sense issued by a country's central bank. But nevertheless the money can be used in Disney areas and are therefore mediums of exhanges. So, technically they are still money and will be even more as people are willing to use them. Money will be used as long as people find them valuable. This particular note was issued in 1993 to celebrate Mickey's 65th birthday. It has its own serial number and can be 'spent or collected or redeemed' at Disney. I have several other notes from Disney and they make interesting collections. 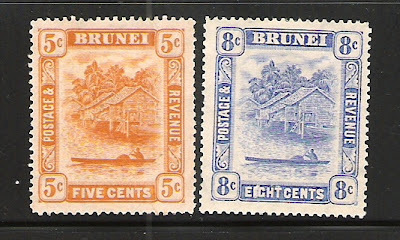 I have been tried to complete the Brunei 1906 first official issues but I am still 2 stamps short. The last two are the most elusive and if I do find them, each will be in the three figure category. So, that will really hurt financialy. I got the next best thing the other day. Since that 1906 stamps are overprints of Labuan's stamps - why not get the Labuan sets? So I did. 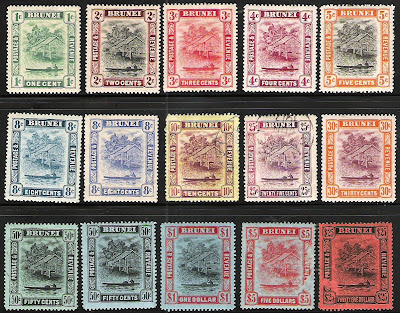 Here are the entire Labuan 1902 set of which only a handful are actually used by Brunei in 1906. The funny thing was that the Labuan set had the entire range of prices and yet on the Brunei stamps, you would find the 16 cents Labuan being overprinted for uses as 10c, 25c, 30c and 50c stamps. It must have been that it was only the leftover Labuan stamps that are used and the 16c stamps must have been overstocked. During Hari Raya, many Bruneians send cards to each other - rather similar to the sending of Christmas Cards or Seasons Greetings Card. Bruneians do it for Hari Raya for the Muslims to celebrate the end of the fasting month and do it for Chinese New Year for their Chinese friends and Christmas cards for their Christian friends. So, we do have many cards to send out. Technically cards should not form part of their blogsite but I thought cards are philatelic and they are nice, so I thought I will share a few nice ones that I received. 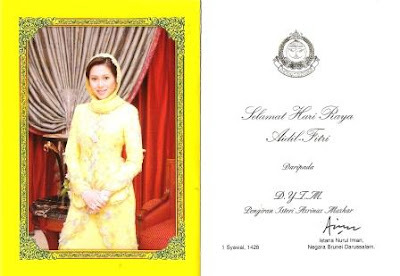 Her Royal Highness Pengiran Isteri Azrinaz was kind enough to send me one and I thought I will share that card with the readers out there. Selamat Hari Raya. SELAMAT HARI RAYA AIDIL FITRI to all Muslim visitors. I wanted to show something Hari Rayaish either money or stamps but unfortunately there is none to be found. Anyway, I will talk about my latest acquisition which arrived just before the Hari Raya holidays. I acquired this first day cover the other day which was to commemorate the first flight of the German made airplane, Foker Friendship, flying from Jesselton (now Kota Kinabalu) to Kuala Lumpur on 10th September 1963. On the cover it stated that it flew from Jesselton to Kuala Lumpur via Brunei, Kuching and Singapore. At the moment I am unable to ascertain whether it actually passed those 3 cities but I would presumed that would be correct as Foker Friendship was only a turboprop (it used propellers or kipas as Bruneians would call it). While looking up information for the above I was checking what happened to Malayan Airways. 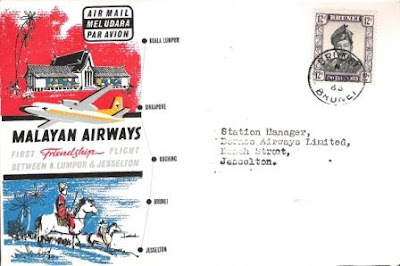 Apparently Malayan Airways was first started as Wearnes Air Services flying from Singapore to Penang via Kuala Lumpur first flying on 28th June 1937 until the eve of World War II. After the war in 1947, Mansfield and Co Ltd formed Malayan Airways resuming Wearnes Air Services route. Malayan Airways also acquired BOAC (British Overseas Airways Corporation) and QANTAS as part new owners expanded their services to make it an international airline by 1957. Malayan Airways quickly expanded and flew to other countries around the region including to Brunei, Thailand, Jakarta and Hong KOng. In 1963, Malayan Airways became Malaysian Airways and by 1966, both Singapore and Malaysian Governments jointly owned the company making it Malaysia-Singapore Airlines (MSA). By 1970, MSA offered services to London. In December 1972, MSA split to become Malaysian Airline System (MAS) and Singapore Airlines (SIA). The last name change was in October 1987, when it became Malaysia Airlines. This is my latest acquisition. 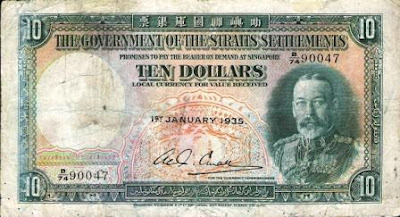 This is a $10 note issued by the Government of the Straits Settlement which means this is legal tender and used for Singapore, the Malay states in the Malay Peninsula and Brunei. 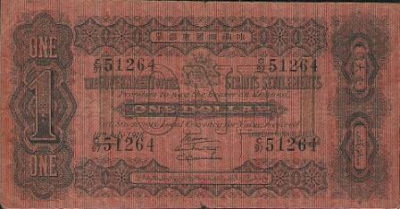 This particular note was issued on 1st January 1935, this is the final note that was issued with the portrait of King George V. King and also under the Straits Settlement Government. In 1940, the first notes printed King George VI and under the Board of Commissioners came into circulation. 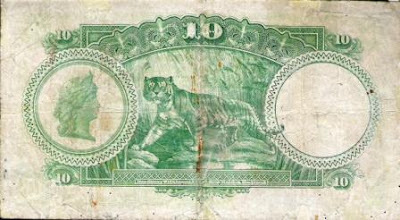 This $10 note has a tiger's head as the watermark. It was engraved and printed by Bradbury, Wilson & Co Ltd. The 1935 are the least expensive of this series which was printed every January from 1931 to 1935. 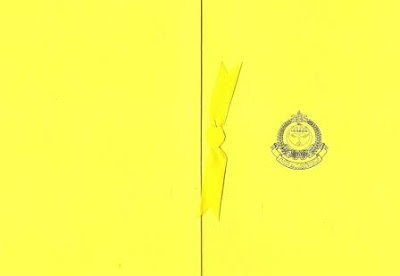 I was going through a number of publications I have while searching for some materials for my weekly newspaper articles and I found an old copy of the Annual Report of the Brunei Currency Board. 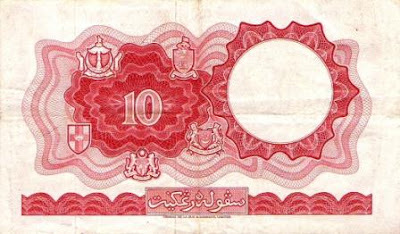 The Brunei Currency Board (now renamed as the Brunei Currency and Monetary Board) is responsible for issuing all the currency notes in Brunei Darussalam. 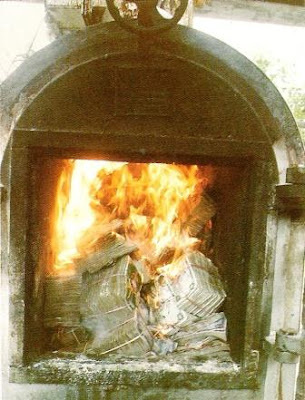 This 1986 report had this photograph of how used and tattered Brunei money was taken out of circulation by being burnt. It was a real live furnance which was used. I am not sure whether this practise is still being maintained or whether they use a shredder nowadays. I have to ask my colleagues. Here is an actual note of the 2007 series. I have scanned only the reverse of the note as that note is the same as the 1996 design despite this design being 11 years old. The year of printing is at the bottom right hand corner which is in very tiny 2 or 3 points size. I have focused on the 2007 so that you can see it better. The note is the same with the 1996 design for all intents and purpose but the only difference is that it is newly printed this year. Yesterday was His Majesty Sultan and Yang Di-Pertuan of Brunei's 40th Anniversary of his ascension to the throne. 40 years ago, Sultan Omar Ali Saifuddien decided to abdicate the throne and put his son up. It was a deft political move by him. The Sultan's Coronation did not take place until the following year. I went through my album hoping I could find a stamp which commemorates his acension to the throne and found none. 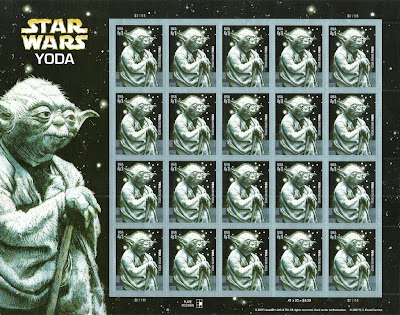 The Postal Authorities were caught by surprise as did everyone else that no stamps were issued to commemorate the event. And by the time they wanted to do one, they might as well prepare for the coronation stamp and that is all that I have philatelic wise. In fact His Majesty's definitive stamps did not come out until 1974 and Sultan Omar Ali's definitive first issued in 1952 was reissued in 1969 and 1972 with different watermark. 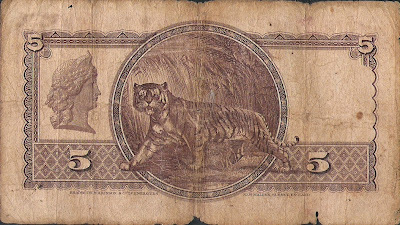 Similarly for currency notes, it was Sultan Omar Ali's notes until 1972 when His Majesty Sultan Hassanal Bolkiah appeared on the note. This is completely unintentional. One of the items I sold on ebay did not make money. It was an FDC of the Crown Prince and Princess Sarah wedding of 2004. Not only did it not get the price to cover the cost of the FDC but I found out later on paypal can't be used and I have to pay for the postage for the buyer to send me the money. 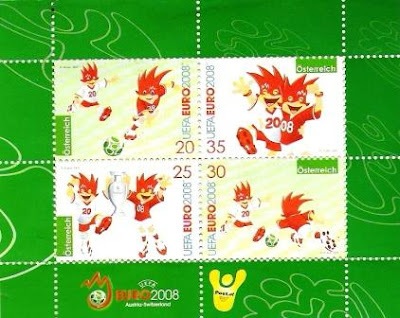 Anyway, his money finally arrived but I wasn't that interested in it (it was only US$3.00) but what was on the envelope was a block sheet of the Euro 2008 stamps! That alone pay for for whatever loss I suffered. Anyway, these ones are from Austria who will be co-hosting the European 2008 Football Championships (UEFA Euro 2008) together with Switzerland. The stamps feature Trix and Flix, the two mascots for the games. Incidentally Trix and Flix were chosen after a three way tie with two other choices which were Zagi and Zigi, and Flitz and Bitz. Trix and Flix got about 36% of the votes. The Euro 2008 also has a slogan - "Expect Emotions." If you can make it to Europe next year, head for Basel, Geneva, Berne, Zurich, Innsbruck, Salzburg, Vienna and Klagenfurt. Klagenfurt? 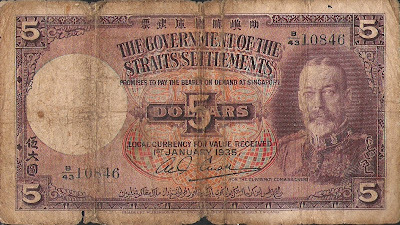 This is currently the oldest $1 note that I have that was issued by the Straits Settlement Government in Singapore for use in the British colonies in Malaya and Singapore as well as for Brunei as its protectorate state. 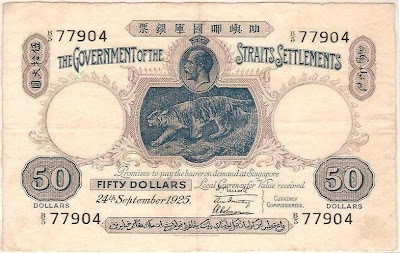 For those in Brunei, we used Straits Settlement money as a result of the 1906 agreement between Britain and Brunei when we have the British Resident. As a result of that too, Sultan Hashim signed a law demonetising other forms of currencies in Brunei other than those issued by the Straits Settlement Government. 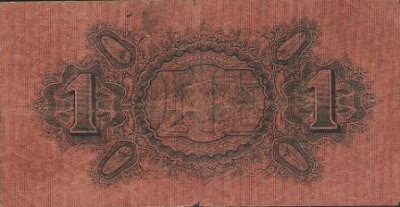 This particular note is the first design of the Straits Settlement paper currency. This was issued between 1906 to 1924 and printed and engraved by Thomas De La Rue & Company (this company also printed Brunei stamps from 1907 until the 1970s). The first issuance was issued on white cream paper and then on pinkish paper which is what I have here. I was quite lucky to get this 90 year old note for about US$105 and the market rate can range from US$125 VG to about US$2,000 UNC. I managed to get the whole sheet of 1 cent 1895 Brunei stamps the other day. 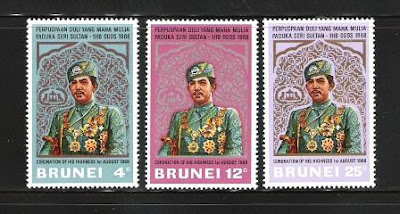 These stamps were printed in 1895 when a Mr Robertson persuaded Sultan Hashim that he can provide a postal service in Brunei if he is allowed to keep the sales of stamps outside Brunei. 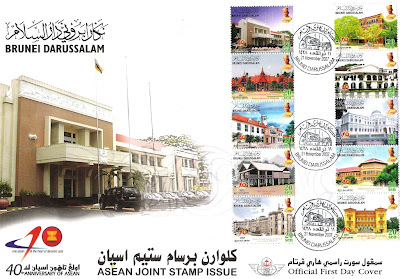 His Majesty Sultan Hashim can keep any revenues received for sale of stamps in Brunei. What Robertson wanted to do was gain revenues from stamp collectors at that time (too many). But his postal service did not last long and died a few years after. But his stamps remained though still not accepted as a 'genuine' issue by some stamp purists. Stanley Gibbons included the 1895 in their catalogue but Scot Catalogue does not even now. 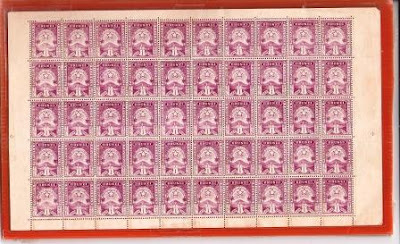 Consequently the 1895 stamps considered as speculative has a lower value than the actual official stamp issued by the government in 1905. 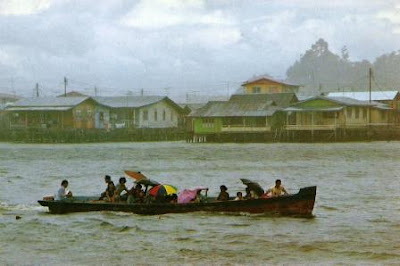 I saw this postcard about Kampong Ayer (for the non-Bruneian visitors to this blog - Kampong Ayer means Water Village and many Bruneians still live the traditional life on the water along the Brunei River) and I thought it looked very familiar. It took quite a while before it hit me. This postcard was used for the reverse of the $50 1995 note. See? I have not ventured into the design of notes. Though I am still quite intrigued why this photo of a number of Kampong Ayer residents crossing the river in the rain would make a good illustration for a $50 note. Any suggestions? "Ich bekam gestern mehere Anfragen wegen einer Neuausgabe in Brunei. So liegt eine Information vor, dass Brunei gestern eine neue 1-Ringgit-Banknote ausgegeben haben soll ! Wenn dies stimmt, können wir noch die 5- bzw. 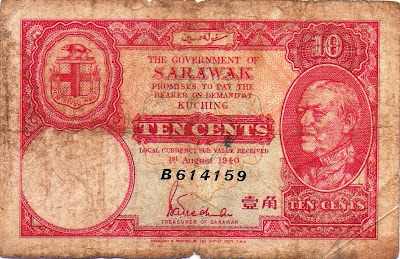 10-Ringgit-Banknoten erwarten mit dem neueren Abbild des Sultans. Bisher ist auf der bruneiischen Sammlerwebseite für Numismatik & Philatelie nichts erwähnt worden. Die Betreiber dieser Webseite sind auch nicht die schnellsten, aber dafür recht ausführlich." "I got yesterday mehere inquiries because of a reprint in Brunei. So an information lies before that Brunei should have issued yesterday a new 1-Ringgit-Banknote 1-Ringgit-Banknote 1-Ringgit-Banknote 1-Ringgit-Banknote BANKNOTE! If this agrees, we can yet that 5- and/or 10-Ringgit-Banknoten 10-Ringgit-Banknoten 10-Ringgit-Banknoten 10-Ringgit-Banknoten banknote expect with the newer copy of the sultan. Previously is on the bruneiischen collector web page for Numismatik & Philatelie nothing mentioned become. The operators of this web page are not also the fastest, but for that quite in detail." Haha... It still looked the same but this new note is printed this year and the only distinguishing mark is the year 2007 printed at the back of the note. You need a magnifying glass to read it. A whole bunch of new $1 notes were printed to replace the 25,000,000 older polymer $1 notes printed in 1996. However no new design was made. It is still printed by Note Printing Australia (NPA). So, there you go. Brunei's new $1 polymer notes. Hope you get one in a green packet this coming Hari Raya. Selamat Hari Raya! This is my latest Singapore currency note. 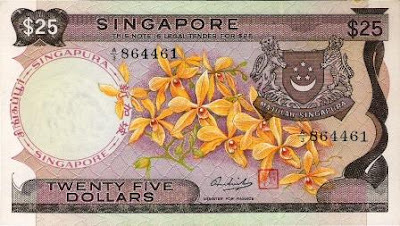 This was the first and only $25 note that Singapore issued way back in 1967. 1967 is a very significant year for Brunei, Malaysia and Singapore as that was the year all the three countries decided that they do not want to jointly issue one currency but instead all three issued theirs independently. This $25 note printed by De La Rue in England was designed to be an interim note between $10 and $50 but for some reason was not used as much. The $10 and $50 remained popular. 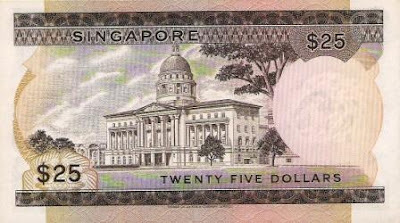 When the Singapore notes was redesigned for the next Bird series in 1976, the $25 note was dropped and the $20 was introduced instead. So this $25, now 40 years old, has acquired a value much higher than the face value. Someone asked me what is the oldest coin in my collection? 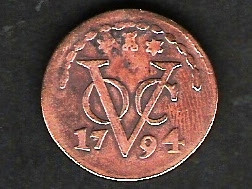 The oldest which actually has the year of minting on the coin is that of a Netherlands coin of 1794 (more than 213 years old). I do have Brunei coins which do not have dates but could date as far back as 1600. I have not actually studied this coin deeply. I know a replica of it was used in the Kalimantan area of our Borneo Island. 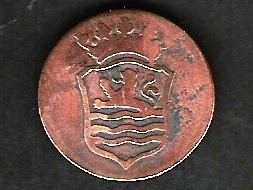 As to whether this Dutch coin was also circulated in Borneo is something I have to verify. But like I said a copy was used and if a copy was used, the original must have been used too. If that's true, then this coin made the circulation in Borneo about 200 years ago. One of the least known facts why Bruneians use British Straits Settlement money (duit Malaya) was that in 1906 when Sultan Hashim agreed to have the British Resident advise him on matters in Brunei was that Sultan Hashim had to demonetise every other form of currency used in Brunei. So only the British from their government centre in Singapore had the authority to issue money not just for their colonies in Malaya but also for Brunei as its protectorate country. The above coins are the last British coins that we used in Malaya and Brunei. The Queen Elizabeth II coins were issued from 1953 onwards and came in the denomination of 50 cents, 20 cents, 10 cents, 5 cents and 1 cent. 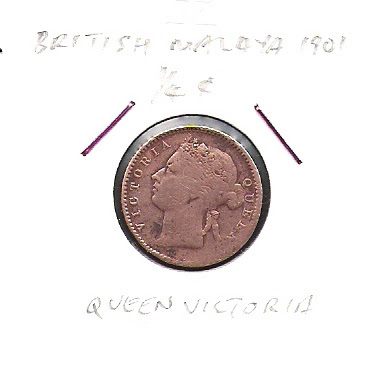 The 1 cent carried on the tradition of being square from the previous King Edward VI. 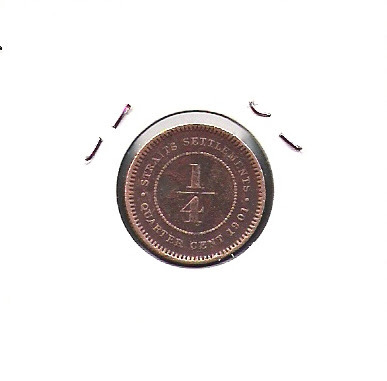 In 1962, the Board of Commissioners of Currency for Malaya and British Borneo issued their first and only coin which was to replace the square 1 cent with the round 1 cent and changed the portrait of Queen Elizabeth to that of the kris. 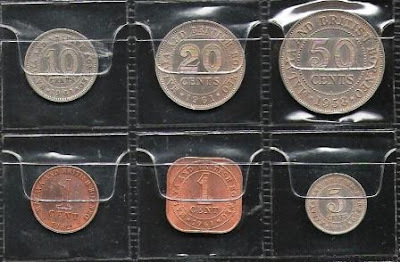 These coins lasted until 1967 when all the countries opted to issue their own currencies. These coins set the size for today's modern Brunei coins. The sizes of these and the present Brunei coins matched exactly. 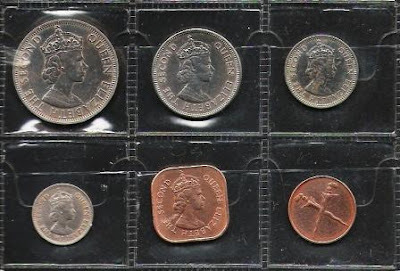 If you still have these British coins, you would have no problem with whatever dispensers coin slots. Though you would be quite mad to do that as the value of these coins have gone past their face values. I have shown Singapore's, Malaysia's, Philippines' and Thailand's version of the whole ASEAN 2007 series of stamps to mark 40th anniversary of ASEAN. But I have never taken a closer look at the actual buildings in those stamps. 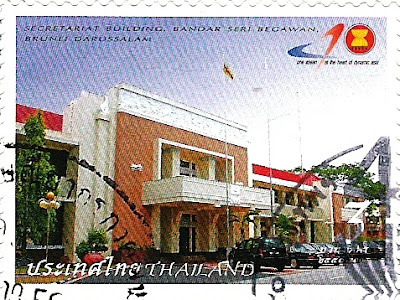 So I thought I will take a closer look at Brunei's building in those stamps and in this case, it is the Secretariat Building. The ASEAN 2007 is supposedly showing ASEAN Architecture of various countries. I am not sure whether the Secretariat Building qualifies it to be a Brunei design as it was a colonial design. I am sure we could have picked a better building to symbolise Brunei's architecture. What say the Architectural readers? Someone on yesterday.sg website linked to my entry on the $1 duit kapal which I did about a couple of weeks back. I thought as a goodwill gesture, I will reintroduce the $10 note which was commonly used by Brunei, Malaysia and Singapore. 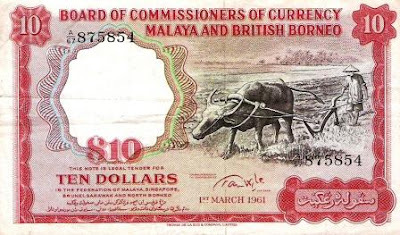 This $10 note was introduced in 1961, 6 years before the breakup of the common currency between the three countries. In those days, Sabah and Sarawak were not yet considered as formal parts of Malaysia. Hence if you look at the back, you will see the crests of Malaya, Singapore, Brunei plus Sabah and Sarawak. This was the last $10 note which were used by all three countries before each began issuing their own in 1967. Note that all three countries, Brunei, Malaysia and Singapore still use the colour red for their $10 notes now.